Over the past 15 years (CY 2004 to CY 2018), the average decline in the 1H bottom-up EPS estimate from October 15 through January 15 has been 2.4%. 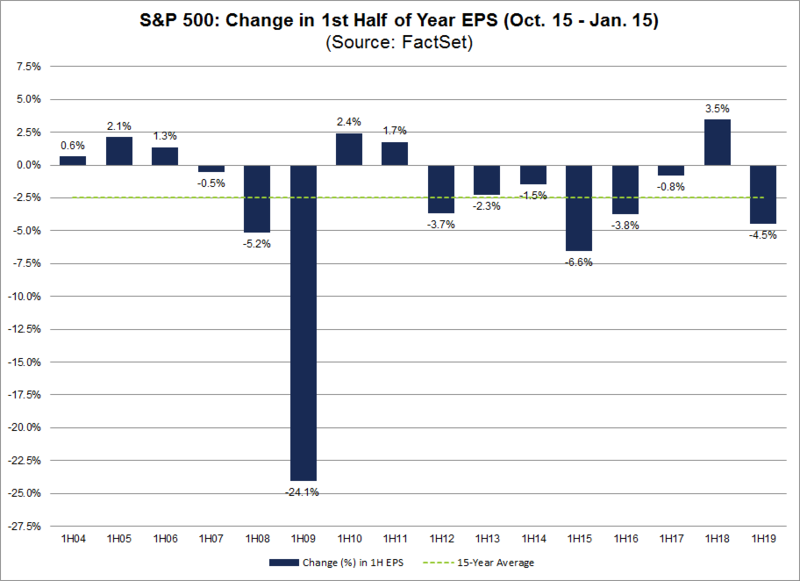 Thus, the decline in the 1H 2019 bottom-up EPS estimate was larger than the average over this time frame. In fact, the 4.5% decline marked the largest decrease since 1H 2015 (-6.6%) and the fourth largest decrease since 1H 2004 over this period (October 15 to January 15). At the sector level, nine of the 11 sectors recorded a decline in their 1H 2019 bottom-up EPS estimate during this time frame, led by the Energy sector. 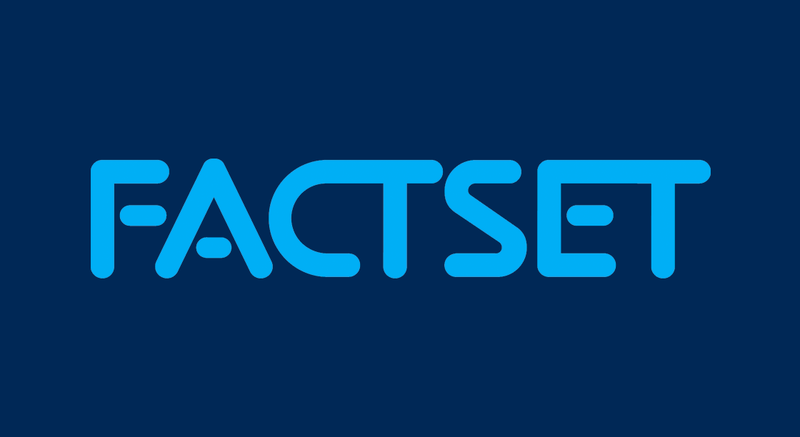 The 1H 2019 bottom-up EPS estimate for the Energy decreased by 29.7% (to $12.20 from $17.37) from October 15 through January 15. During this same period, the price of oil fell by 27.4% (to $52.11 from $71.78). 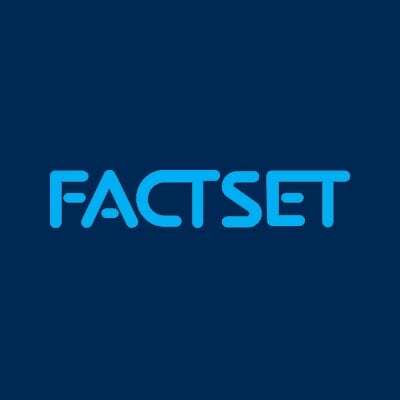 Other sectors that witnessed significant declines in their 1H 2019 bottom-up EPS estimate during the past three months are the Information Technology (-7.2%) and Materials (-5.7%) sectors. It is interesting to note that these three sectors (Energy, Information Technology, and Materials) are three of the four sectors with the highest international revenue exposures in the index. 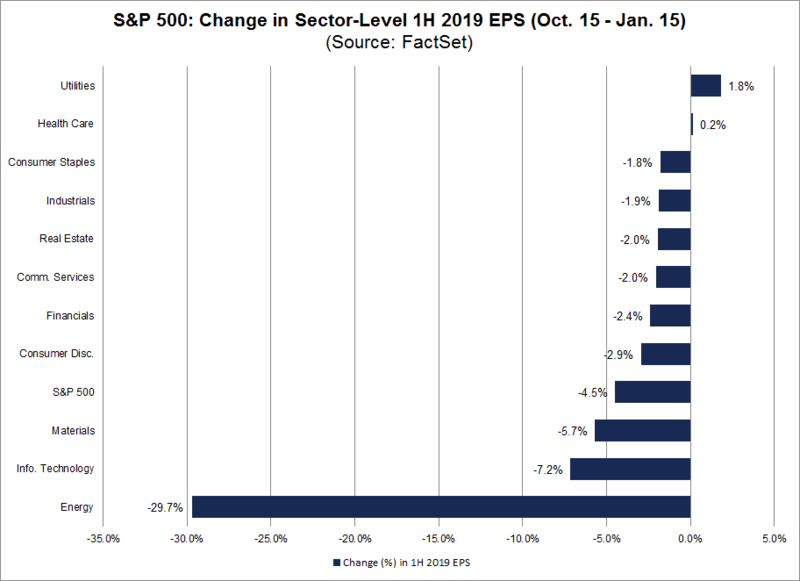 The only two sectors that saw an increase in their 1H 2019 bottom-up EPS estimates over the past three months are the Utilities (+1.8%) and Health Care (+0.2%) sectors. 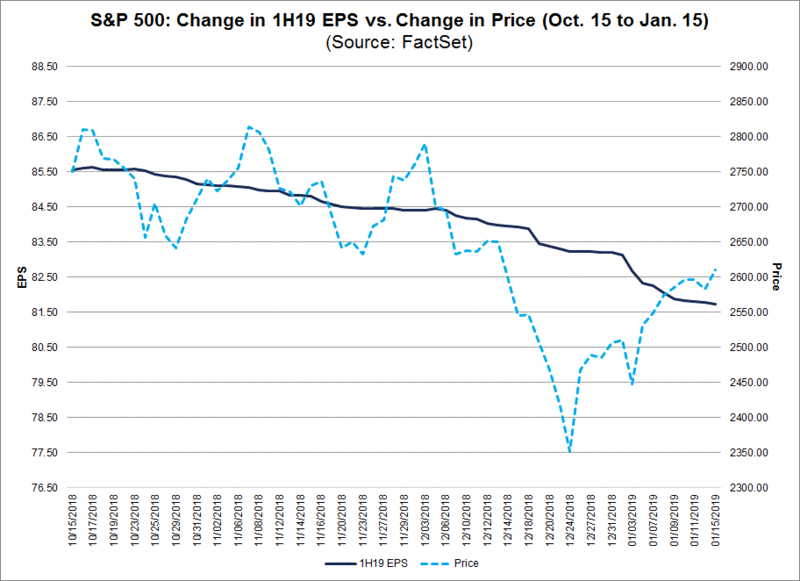 As the 1H 2019 bottom-up EPS estimate for the index declined during the past three months, the value of the S&P 500 also decreased during this same period. From October 15 through January 15, the value of the index decreased by 5.1% (to 2610.30 from 2750.79). Ten of the eleven sectors recorded a decrease in price during this period, led by the Energy sector (-14.4%).